Parties, presents and people galore. Oh my. Manoeuvring around throngs of Christmas shoppers is now the everyday norm. And even though admittedly tis the season to think of those you love, in the frenzied run-up to Christmas don’t forget to inject a little pampering into your own life. And that’s exactly what I do. I head off to the Savannah Day Spa with a friend at the Menzies Hotel on Washington Street. Our day starts with a tour of the place where we admire the jacuzzi, steam room, sauna and pool – complete with loungers to unwind on…because sometimes even swimming can be too much activity. Essential relaxation – fluffy robes included! After getting comfy in fluffy robes we’re escorted to the treatment room complete with soothing music and calming lighting with candles. A little surprising – our initial treatments happen in the same room. So, if you’re going with a friend make sure it’s a good one! But our inhibitions are banished by an absolutely fantastic head, neck and shoulders massage – quite honestly the best I’ve ever had. Next up is a facial, complete with head massage; I’ve never felt more relaxed. And my friend is whisked away to get her nails done. And after I’ve been thoroughly pampered I’m left to relax – perhaps a little too long. I doze off for quite some time and find two staff outside waiting patiently for me to leave. In the lounge I’m reunited with my freshly shellacked friend and her perfect nails. 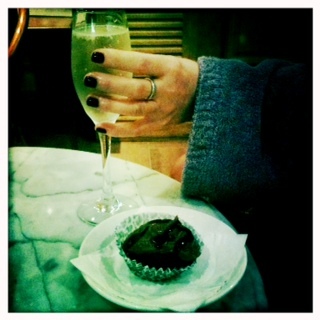 We enjoy a scrumptious lunch that includes a glass of champagne and cupcake. Totally chilled, the bubbles go straight to my head. We spend the rest of our blissfully relaxed day wandering between the steam room, jacuzzi and loungers. And I even give the pool a go – swimming a few lengths but nothing too strenuous of course. At £39 (on Woucher – normally £91) it’s money well-spent. Full use of the spa facilities, two mini treatments, champagne and a cupcake later, we are fully rejuvenated and ready for any Christmas chaos ahead. So go on – check out some of the saving sites like 5pm, Last Minute and Woucher for an inexpensive guilt-free pre-festivities pick-me-up. This entry was posted in Uncategorized and tagged City Centre Glasgow, Relaxation, Savannah Day Spa, what to do in Glasgow. Bookmark the permalink.